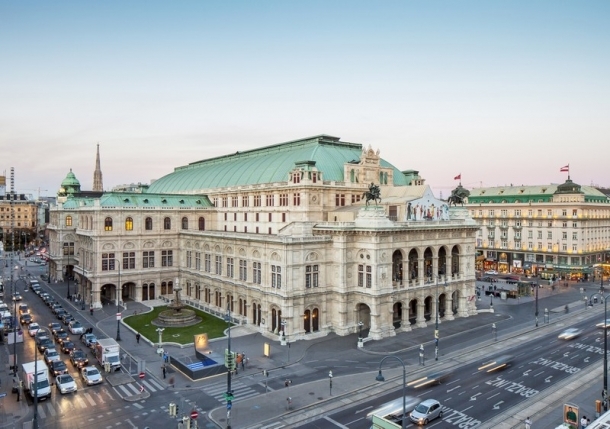 2019 sees the 150th anniversary of the grand opening of the opera house on Vienna’s showpiece Ringstrasse boulevard. The Vienna State Opera officially opened on May 25, 1869 with a performance of Mozart’s Don Giovanni. To mark this special anniversary the opera house will stage an official ceremony followed by the premier of a new production of Richard Strauss’ opera The Woman Without a Shadow on the evening of May 25, 2019. The anniversary celebrations will continue on Herbert-von-Karajan-Platz outside the venue the next day. The public spaces around the venue will play host to unconventional performances full of surprises by singers from the ensemble, guest stars, dancers from the Vienna State Ballet and many other artists. The 2018/19 program at the Vienna State Opera features an unparalleled mix of 50 operatic works, 16 ballets and five children’s performances. The six opera premieres at the Ringstrasse venue include new productions of classic repertoire pieces such as The Woman Without a Shadow by Richard Strauss, Otello by Giuseppe Verdi, Hector Berlioz’ Les Troyens and Gaetano Donizetti’s Lucia di Lammermoor. Manfred Trojahn’s Orest adds a contemporary piece to the mix, while Johannes Maria Staud’s Die Weiden contributes a world premiere to this year’s impressive line-up. All told, the coming season will feature more than 350 dates including 217 opera and 58 ballet performances. There are also eight concerts, nine vocal matinees, ten chamber music matinees, nine other matinees, numerous performances of children’s operas, concerts for kids and other events. In addition to all of the live events on the Ring, the State Opera is also expanding its streaming services (www.staatsoperlive.com), with 45 of its performances available to view online. The 2018/19 free Oper live am Platz season will see around 85 performances transmitted live to a 50m² video wall on Herbert-von-Karajan-Platz in April, May, June and September. On February 28, 2019 the Vienna Opera Ball will take place for the 63rd time when it transforms the concert venue into a magnificent ballroom for the night. The following day brings two performances of The Magic Flute, specially adapted for children.